For the past two years or so, Google Chrome was the browser to beat in terms of compatibility with HTML5 and CSS3 support. Most reviewers used sites like HTML5Test to compare browser support for web technologies. As it turned out, Chrome has always been the leader of the pack in this regard. That is, until now. It is interesting to note that it is not Firefox, Opera, Safari or Internet Explorer that is dethroning Google's browser in this regard. No, it is Maxthon, a browser that has been around longer than Firefox or Google Chrome have. Maxthon 3, released in 2010, marked a shift away from using Internet Explorer's rendering engine Trident solely, towards the use of Trident and Webkit. 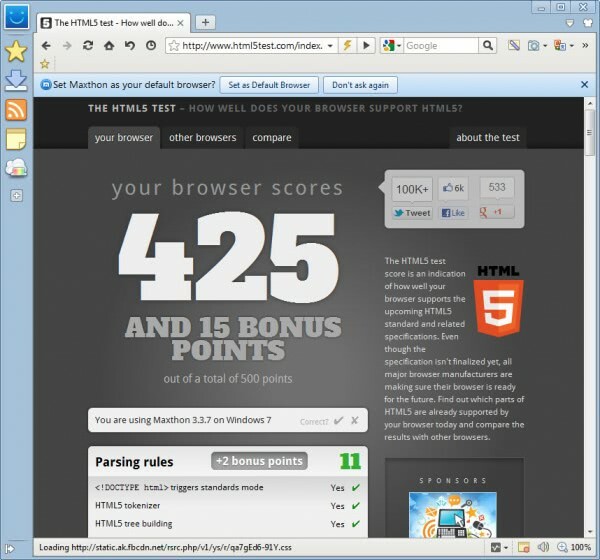 Maxthon users who visit the HTML5 Test website will notice that their browser scores 425 and 15 bonus points out of 500 total points, which exceeds the latest Google Chrome Canary build result by 15 standard points and 2 bonus points. The two are the only browsers to break the 400 point mark in the test. They are followed by Firefox, Opera and Safari which all score in the mid to low 300 point range. Maxthon 3 comes with a comfortable feature set combining both popular options like private browsing or data synchronization options with features that you won't find in any or only some browsers. This includes a screen capture option, built-in RSS reader, the muting of audio on a per-tab basis or an option to auto refresh web pages. If you are now interested in giving the latest version of Maxthon a try, download it from the official developer website. It is available as a setup version and portable versions. Maxthon 3 is only available for all recent versions of Microsoft Windows, and the Android mobile operating system. Does it mean that Maxthon 3 is more compatible than other browsers? It still depends on the site's you visit, and what HTML5 technologies they make use of. Still, it is a great feat for a browser that is less popular than the big five. -1: No Linux version. Looks like it would be okay if you only use Windows. Maxthon is great, but Firefox is something else.